Cody was something of a deviation from our national park-based itinerary, but a stop that was high on our priority list, mainly because in all of our conversations with fellow RVers, as soon as the word “Cody” was mentioned, it seems like everyone immediately said, “You’ve got to go to the museums in Cody.” Frankly, it got to be a little weird. 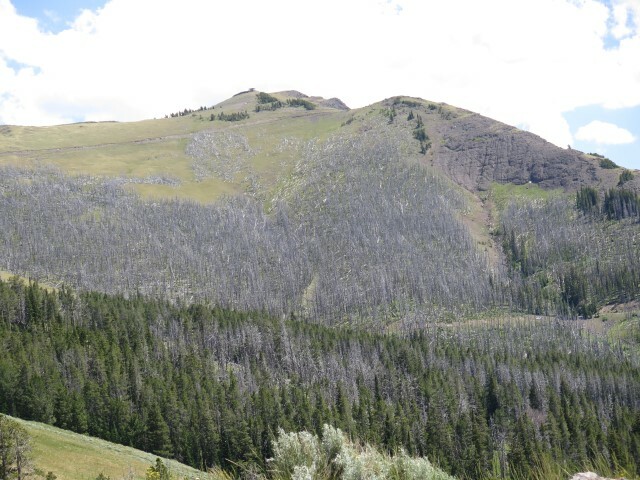 Sometimes we weren’t even talking about Cody, just maybe something about shortcutting across Wyoming, and the comment was the same: “You’ve got to go to the museums in Cody.” What the heck, over? As it turns out, the Buffalo Bill Center of the West in Cody is worth every accolade it receives, a “gem” as the AAA Tour Guide puts it. 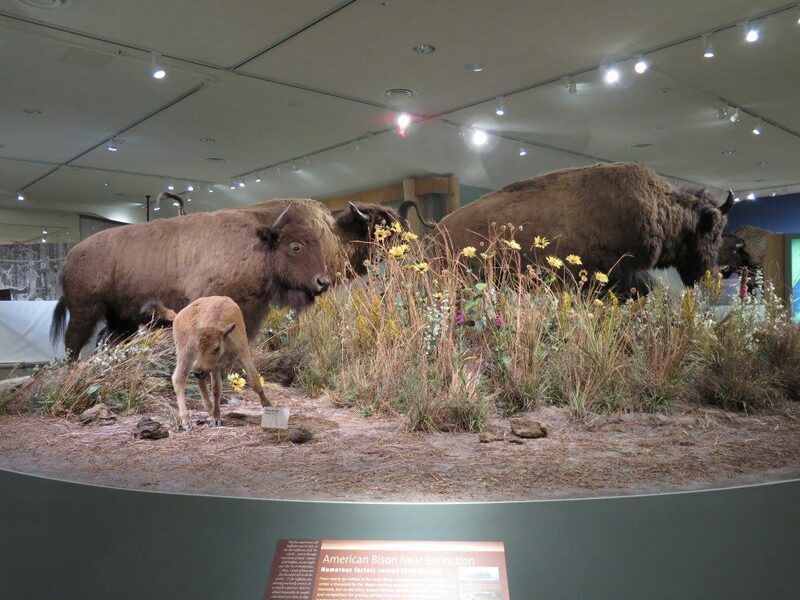 There are actually five world-class (like Smithsonian quality) museums here: the Buffalo Bill Cody Museum itself, the Draper Natural History Museum, the Whitney Western Art Museum, the Cody Firearms Museum, and a Museum of the Plains Indians. Each is, in its own way, memorable. 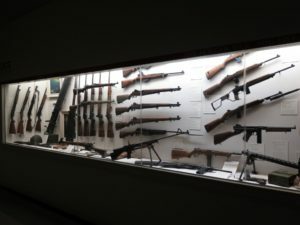 The firearms museum, for example, houses the largest collection of firearms in the United States, and the second largest in the entire world. (Only the Ruskies have one that’s bigger.) 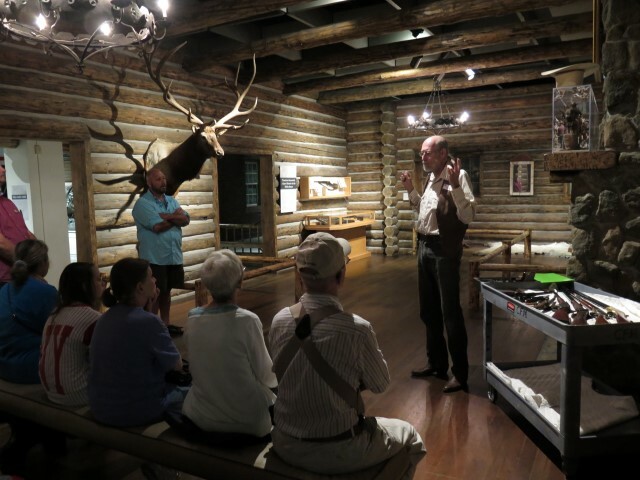 We attended a lecture on the firearms of the old west, starting with the flintlocks used by the early trappers and continuing through the Colt Peacemaker and Winchester 73. All of the firearms were in working order and available for people to handle. Fascinating. 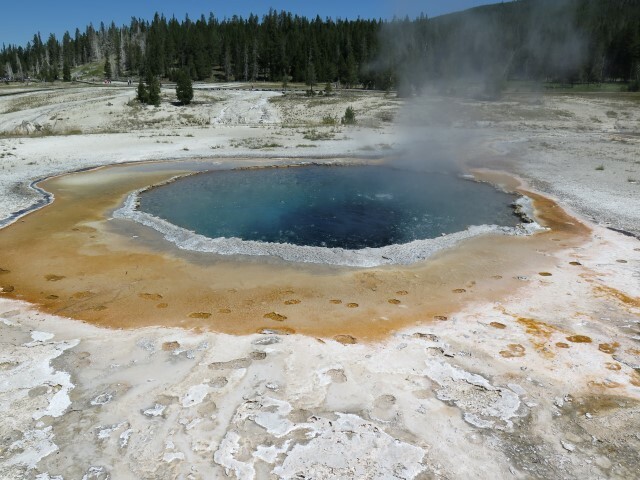 The museum of western art houses an extensive collection, organized along various themes (landscapes, animals, people), including a whole wing dedicated to art depicting the sights of Yellowstone. It has extensive collections of works by Remington and Russell, and even has a full-size replica of Remington’s studio in New Rochelle, NY. As we were walking around, there was a lecture comparing Paxson’s famous “Custer’s Last Stand” to a contrasting Indian painting depicting the same battle (both part of the museum’s collection). Although I’m not generally very interested in American Indians, the Museum of the Plains Indian provided extensive displays, films, and audios showing traditional Indian life (both before and after the arrival of horses), Indian encounters with the white man, and Indian life since then. 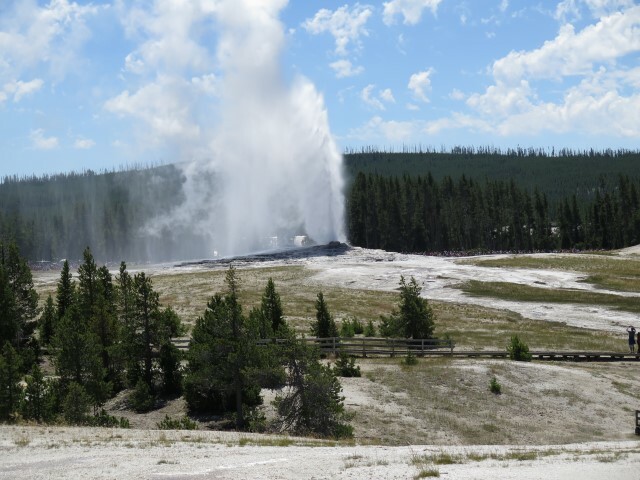 The natural history museum, besides providing wonderful displays of the wildlife of the Yellowstone ecosystem, features a huge wing built using a series of circular ramps and staircases, allowing visitors to work their way downward through the various zones of the western ecosystems, starting with the alpine environment (above 10,000 feet), and working down to the subterranean layers where fossils and natural resources tell the story of prehistoric times. 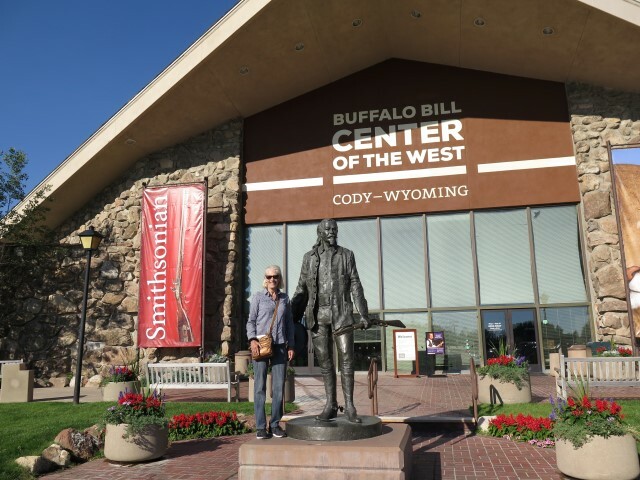 The Buffalo Bill Center of the West, a complex of five world-class museums. At the entry to the natural history museum. All of the animals on display were done a world-famous taxidermist, known for his complex displays that incorporate extensive natural features and place the animals in realistic postures. 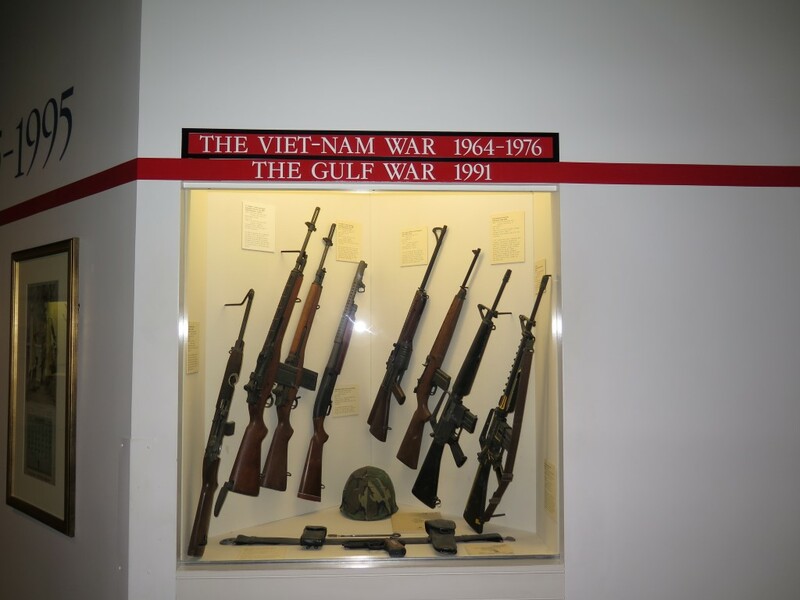 In addition to the permanent displays, there are always fascinating temporary exhibits and lectures. Currently, there’s one on gunfighters of the old west, a display I really, really wanted to see, but forgot about and missed because I have no brain. I regret that this little blurb really can’t do justice to the true excellence of this museum complex, but if you’re sitting around, just page through the museum’s web site and get a sense for yourself. Given all of this, one might ask how it could be that museums of such conspicuous quality could come to be located in, of all places (no offense intended), Cody, Wyoming. We asked. 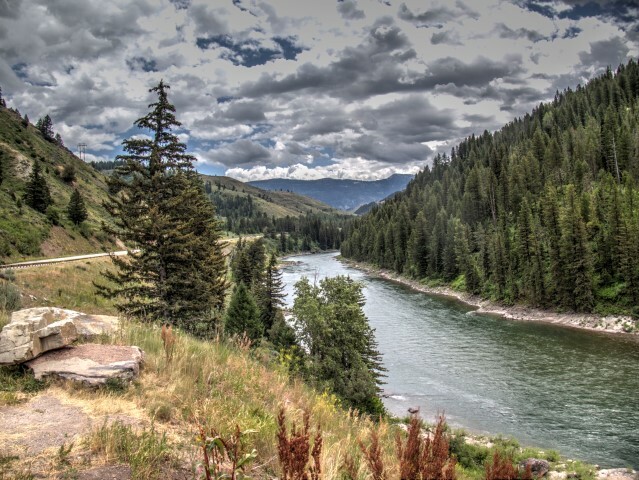 The answer is that it all began with Buffalo Bill Cody himself, who used the money he made from his Wild West shows to found, organize, and develop the town of Cody. Then, starting with the original museum of Buffalo Bill memorabilia, a long list of benefactors (including, of course, Laurance S. Rockefeller) began expanding the original structure and donating items for the collection. Over time, the momentum of it all created something of a chain reaction that ended up with world-class displays in multiple areas of focus. It has now gotten to the point where about ten percent of each area’s displays are changed out each year, and each museum’s entire display is actually replaced every 10 years. Only about one-third of the collection is on display at any given time. Some of the materials are housed in a special research facility that, unfortunately, will probably never be put on public display. Cody has something to offer hard to find anywhere else. As if that isn’t enough, Cody is chock full of other “gems.” The Cody Cattle Company dinner and western music show was great. Just to illustrate how good it was, the guitarist is a recent winner of the Western Music Association “Best Instrumentalist” award. And he deserves it. His guitar playing was among the best I’ve ever heard. The music was great (we didn’t want the show to end), the performers were funny and entertaining, and the food was wonderful. 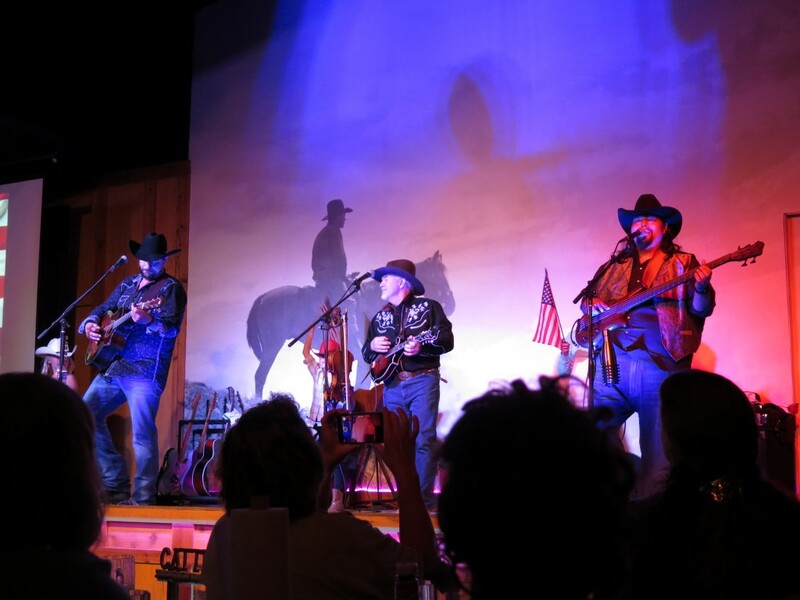 The “Triple C Cowboys” at the Cody Cattle Company dinner show. We had all-you-can-eat brisket and chicken, with a whole bunch of other fixin’s, and unbelievably good corn bread. 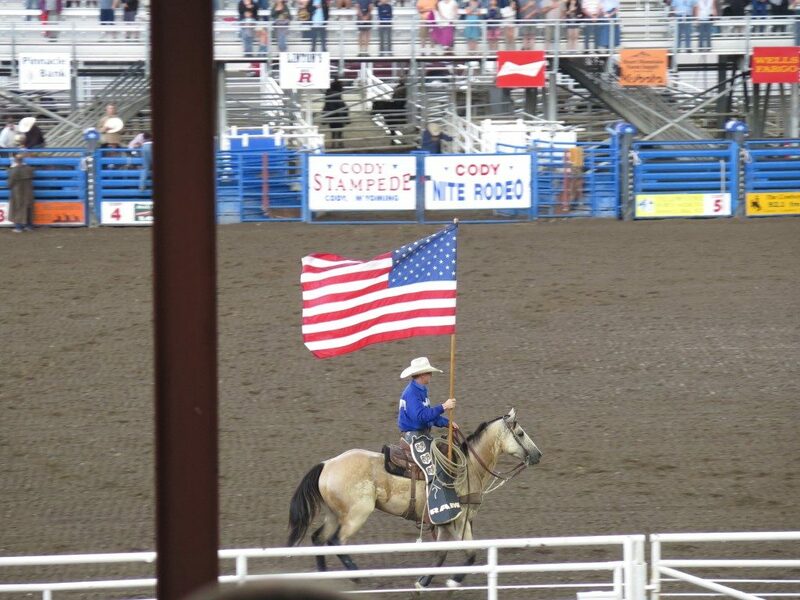 And then it was off to the Cody Stampede Rodeo. I love rodeos. You might think that a rodeo that performs every night in the same place wouldn’t be up to the standard of rodeos one would see on the circuit, but it was darn good. Most of the performers are PRCA cowboys, working during the summer to “put food on the table” (as the announcer put it, implying, without saying as much, that being a rodeo cowboy is a hard life), and the rest of the performers were very competent locals, including a bunch of youngsters (even young bronco busters) that made for a completely wonderful show. This is Wyoming, so (of course), the festivities begin with a prayer, the Star Spangled Banner, and a salute to veterans. 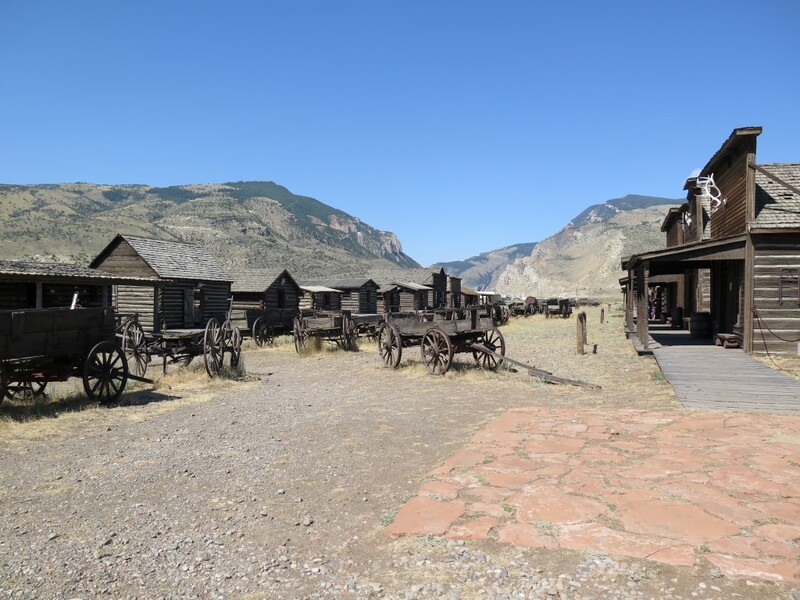 And the next day, it was another “gem”: Old Trail Town, a collection of actual buildings from the old west that have been carefully relocated to Cody, including for example the cabin used by Butch Cassidy and the Sundance Kid as they hid out after their exploits. And a bunch of famous old west personalities are buried here, including Jeremiah Johnson. Twenty-something buildings from the old west era. Totally fascinating, if for no other reason than to convince both of us that we don’t have what it takes to be a pioneer. 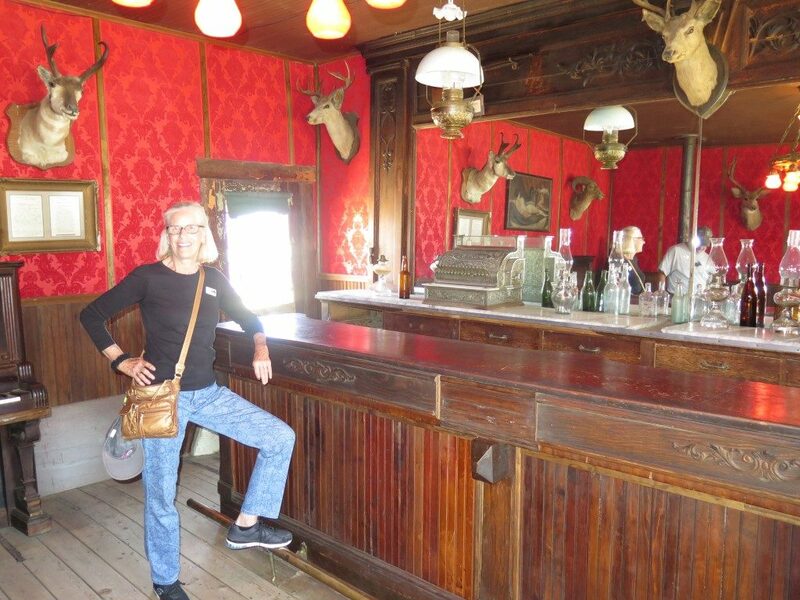 An actual old west saloon, where a surprisingly large collection of nefarious gunslingers actually hung out. It’s teeny. Maybe a dozen guys could fit in there, but it would be real crowded. Any more than that and it’s no wonder they were always shooting each other. I know this is getting repetitive, but there was yet one more “gem” on the itinerary: the Irma Hotel, the hotel build by Buffalo Bill himself and named after his daughter, Irma, and famous for its $100,000 bar. We treated ourselves to an all-you-can-eat prime rib dinner that was wonderful. 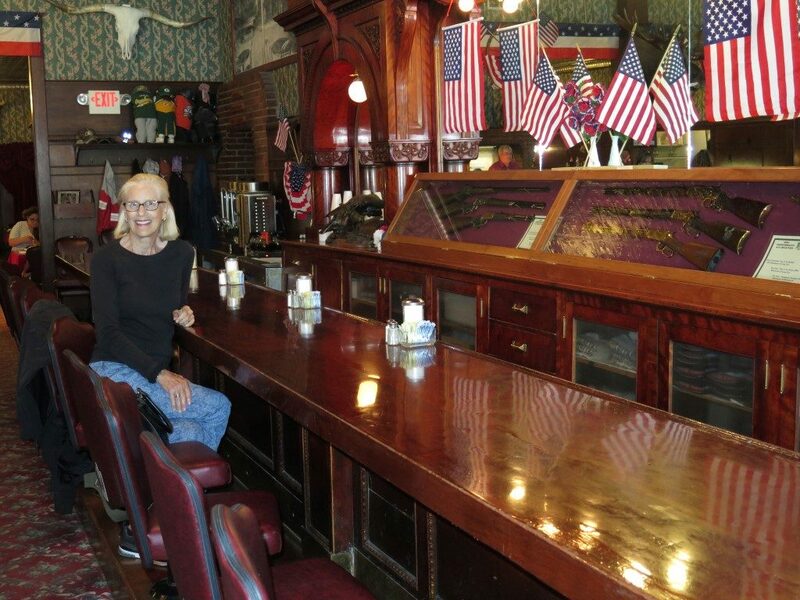 Notice the common theme: Wendy sitting at a bar in a saloon. No further comment. And, of course, all good saloons come with a, um, what did they call Miss Kitty, a “hostess”? So Cody was a great stop in all respects and a fitting finale. Our trip of a lifetime is basically over, and today we start the L-O-N-G trek home. Some final thoughts about the trip, and the prospects for the dogs, will follow once we’re back. This entry was posted in Travels on July 29, 2016 by skiprd. This stop didn’t start well… After arriving and setting up, we followed our standard routine of going to the visitor center, getting the maps and trail guides, and asking our usual question of the ranger: “We only have ‘x’ days here, what are the top things we should do?” Then, collecting the information we received, we decided to sit down over a cup of coffee and plan out the next three days. Glacier runs a shuttle between various areas of the park, so we thought it would be fun to take the shuttle to the Lake McDonald Lodge, seeing the beautiful mountains as we went, grab a chair in the lobby overlooking the lake, and make our plans. Bad idea. First, I have no idea what I was thinking. I hate buses, especially diesel-powered, fume-belching, loud vehicles like the one that awaited us, made even worse by a what I assume is a disintegrating transmission that emitted an ear-piercing whine every time it was revved up. And then, the Lake McDonald Lodge is a L-O-N-G ways from the visitor center, and there’s nothing to see enroute. 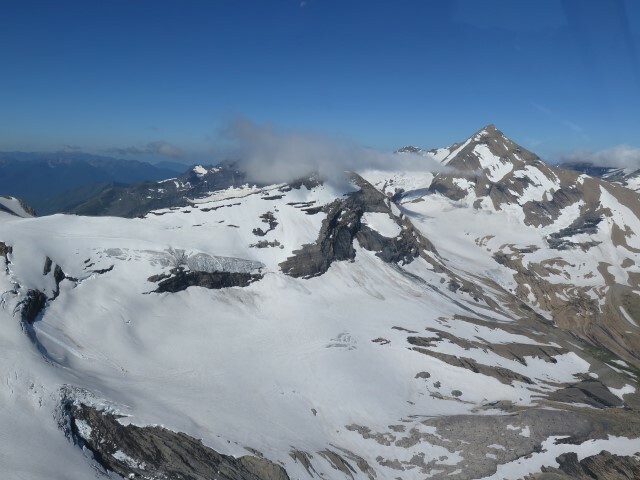 No mountains, no glaciers, not even decent views of the lake. And then, the Lake McDonald Lodge is definitely nothing to get excited about, certainly not on a par with the Jackson Lake Lodge or the Yellowstone Lodge, and there was no place to sit anyway. And finally, on the way back, the shuttle only ran in one direction, so we had to go way up the park to get to the turn-around point, where our 20-seat shuttle bus was boarded by 50 hot, sweaty hikers, giving it the all the ambiance of a jitney in Calcutta. 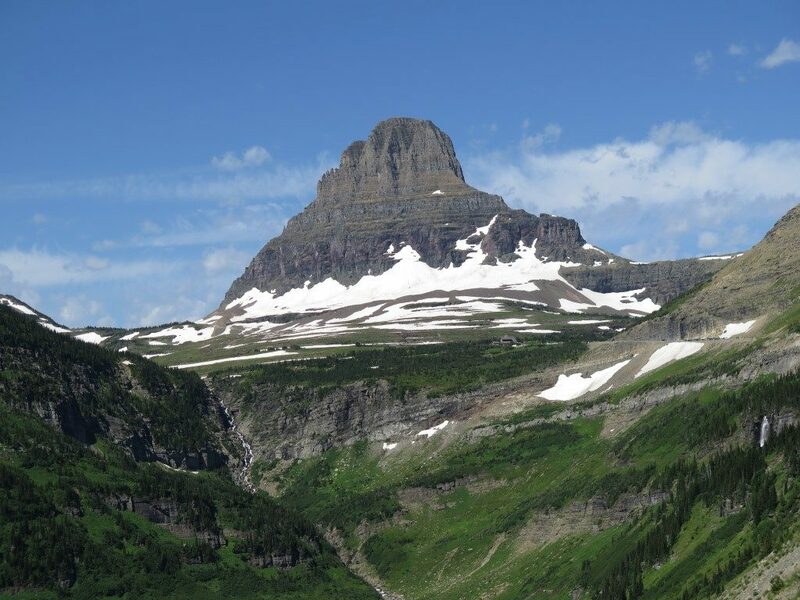 But, the next day, the sun came up, my disposition improved, and it was time to do the famous Going To The Sun Road. Words cannot describe that drive: 48 miles of an amazing engineering accomplishment routed through the most breathtaking scenery in America. That faint line you see angling upward is the road; look closely and you’ll see that those little dots are cars. 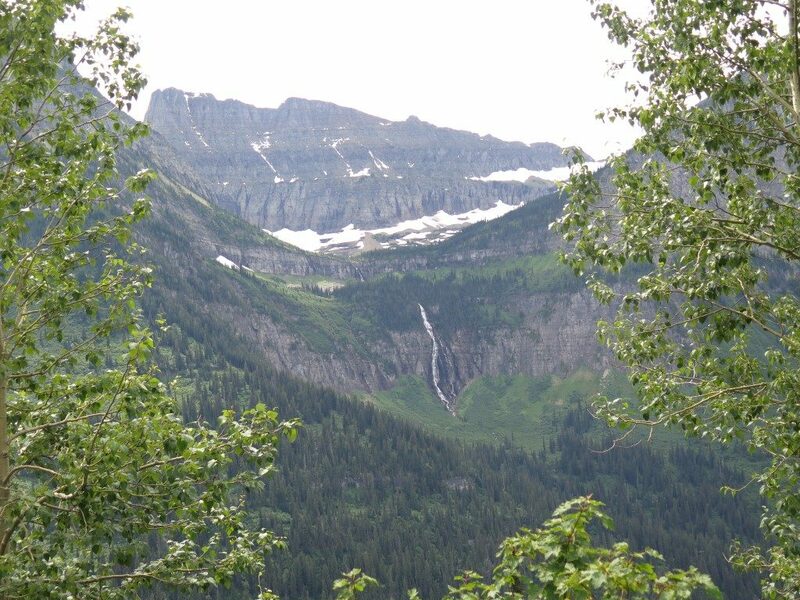 The melting glaciers and snow fields create hundreds of waterfalls. 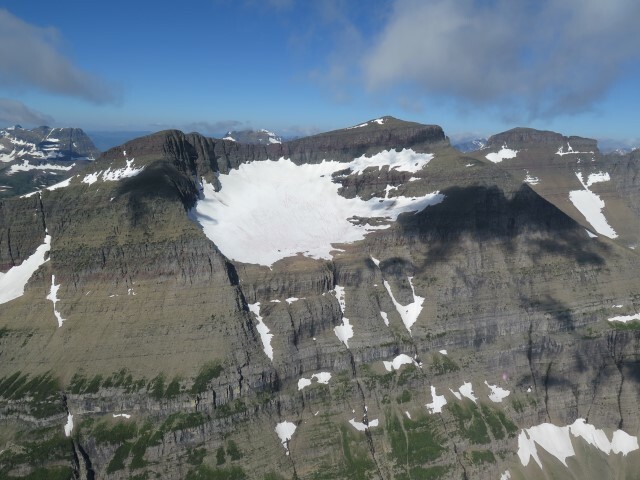 Here’s something that’ll make your brain hurt: The mountains that form the landscape, as can be seen in the photo above, are all sculpted sedimentary rocks. How could sedimentary rocks exist in what is an extension of the granite Rocky Mountains to the south? 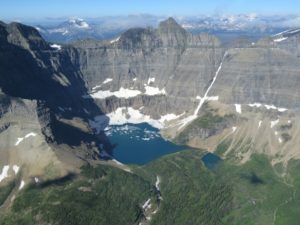 It turns out that about a billion-plus years ago, a huge sea (the “Belt Sea”) covered the area of present-day eastern Washington, northern Idaho, western Montana, and nearby areas in Canada. 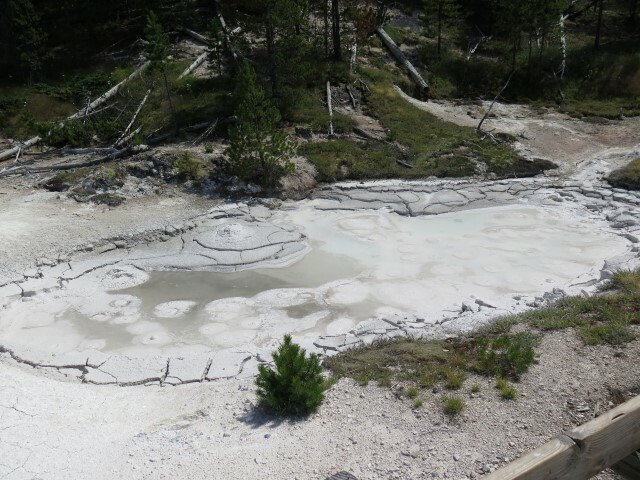 Over time, about 18,000 feet of sediment were deposited in the sea, which turned into the sedimentary rock of this area. (I can’t imagine 18,000 feet of sediment, but don’t hang up on that concept; things are about to get even weirder.) 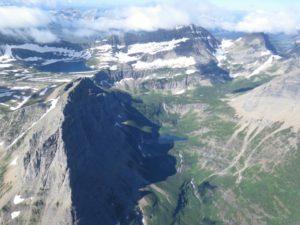 About 150 million years ago, the tectonic plates of North America started pushing against each other, forcing the uplift that created the Rocky Mountains. But while that was happening (according to geologists) a piece of the much older sedimentary rock from the Belt Sea, a piece about 300 miles long, 50 miles wide, and 20,000 feet thick, broke off and slid 50 miles eastward, so that it covered the younger rock of the Rocky Mountains rising underneath it. Excuse me? 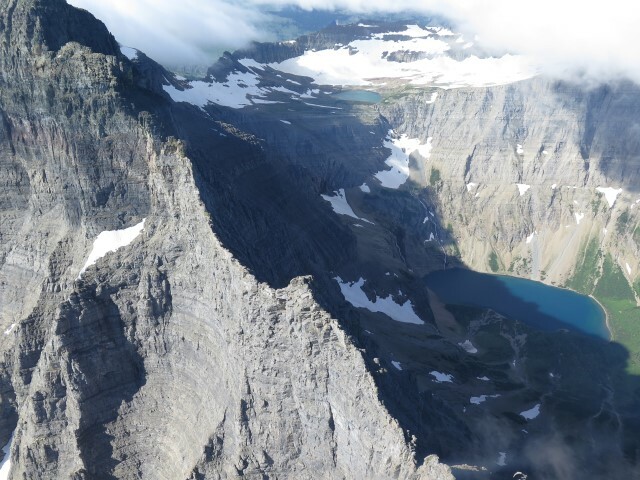 A sixty thousand cubic mile “piece of rock” “slid” to the east? It is that “piece of rock” that now forms the peaks of Glacier National Park. Then, about 2 million years ago, when about one-third of the planet was covered in ice up to 5000 feet thick, glaciers scoured the area creating the horns, aretes, and valleys we see now. Next day, it was our favorite thing to do: hiking. The weather was cloudy and cool, but that’s not necessarily bad for a hike. So we were off to Logan Pass to do the hike to Hidden Lake. 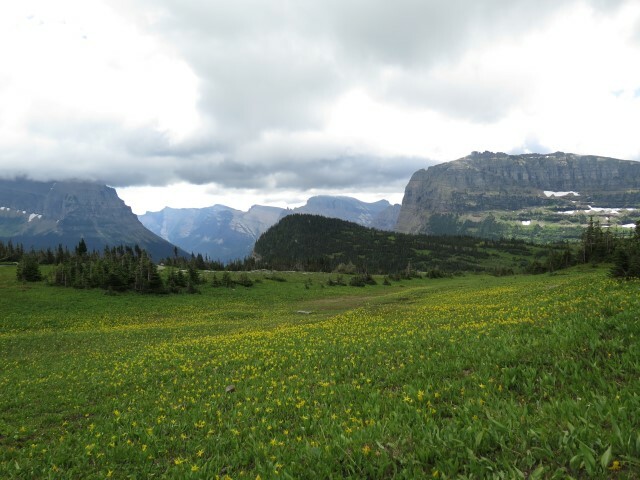 A field of “glacier lilies,” beautiful, small, fragile lilies that bloom for only a short time during the alpine summer. 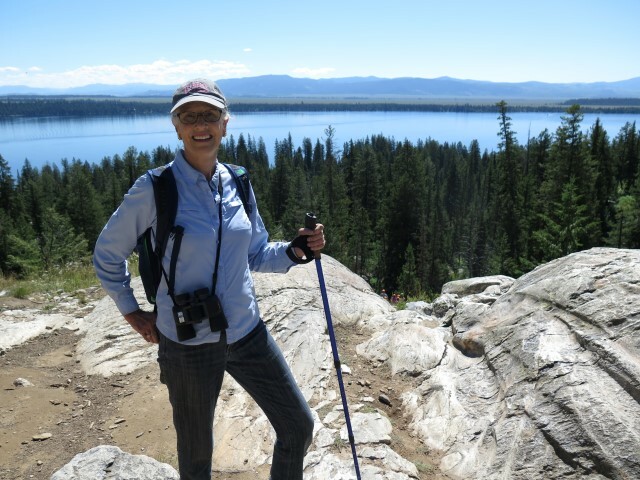 And then, off to the “Highline Trail,” a narrow (sometimes only 18-24″ wide), scree-covered pathway that clings to the sheer rock face. Definitely not a place for those afraid of heights. 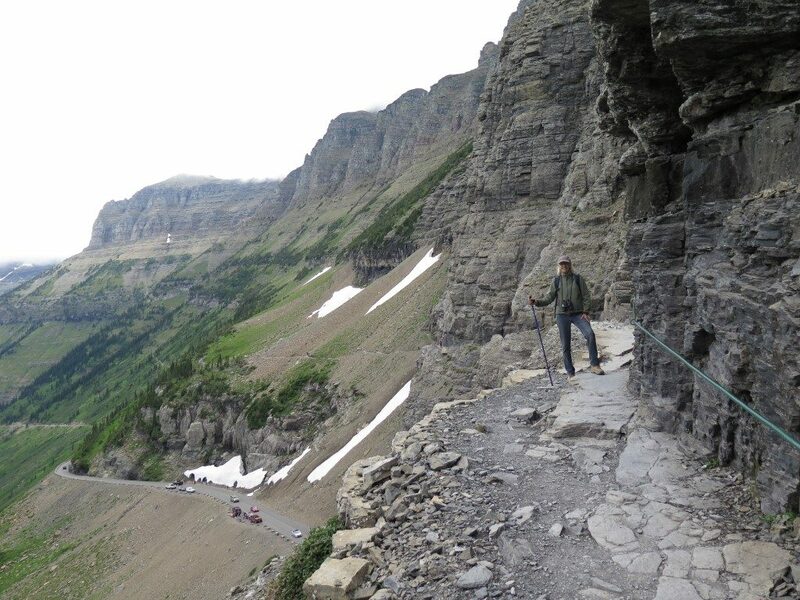 The Highline Trail presents the prospect of a life-ending fall to the Going to the Sun Road a couple hundred feet below. 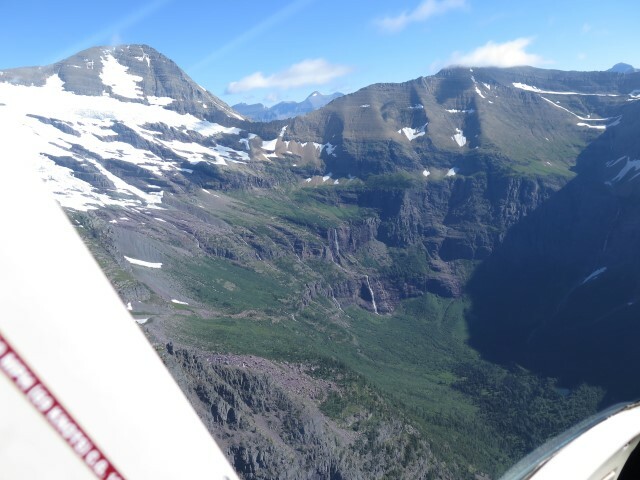 Still, if one is going to plummet to a certain death, the Going to the Sun Road isn’t a bad place to end up. 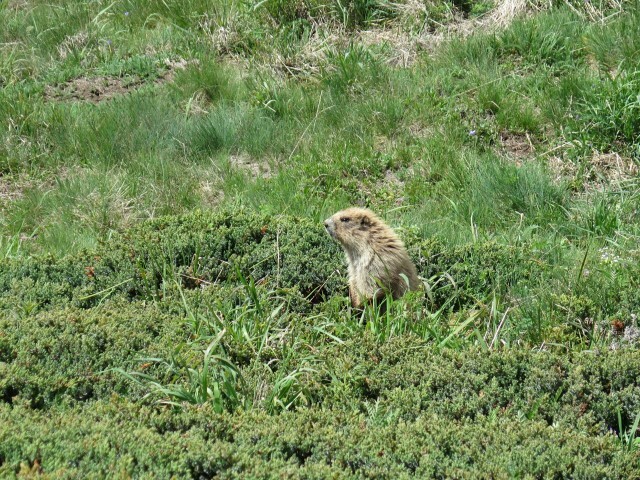 And finally, FINALLY, we got to see real, actual wildlife! Hmmm. Tourists displaying what is sometimes called “inappropriate behavior,” although that phrase doesn’t seem to do justice the extent of the bad judgment seen here. 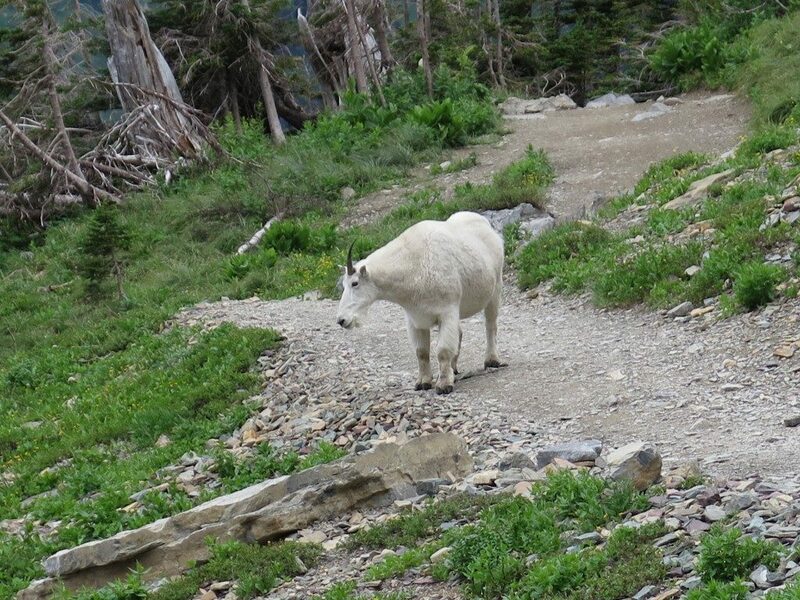 To me, “inappropriate behavior” is using the salad fork for the entree; cornering a wild animal on a narrow mountain trail warrants a harsher assessment. 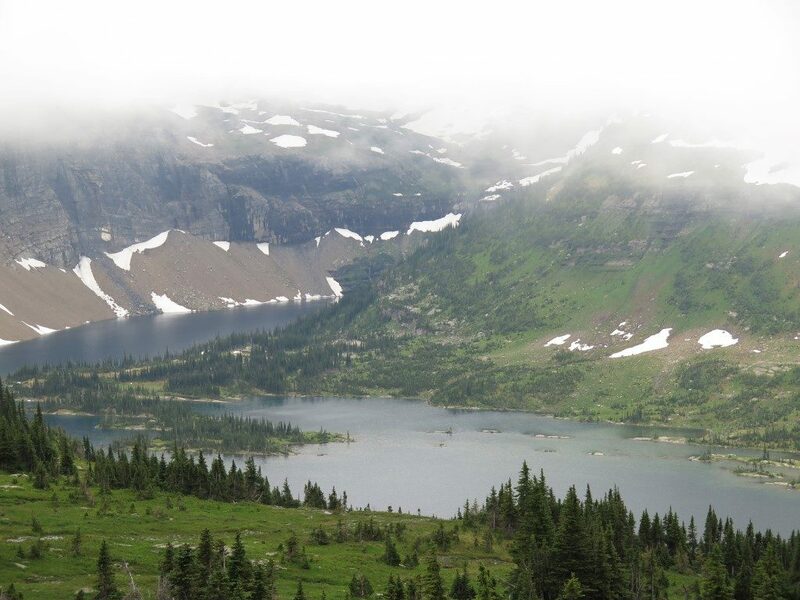 On Sunday afternoon, we did another fun hike, this one up to Avalanche Lake. Stunning. 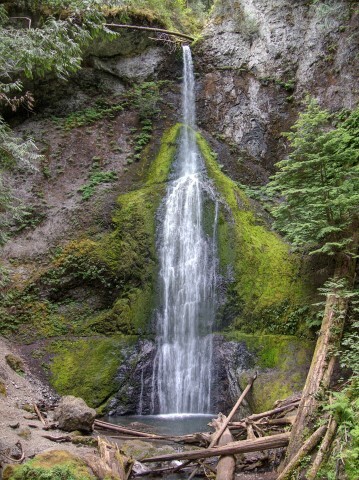 Avalanche Lake, about a 5-mile round-trip hike, and worth every footstep. Yes, three waterfalls cascading down into the lake. The water is so clear you can’t see it; those logs you see scattered behind us are all underwater. But before we did the afternoon hike, we faced a realization. 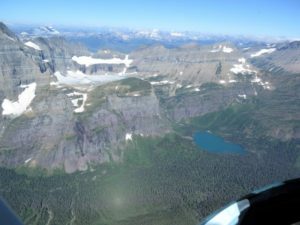 Most of Glacier National Park is roadless and inaccessible. 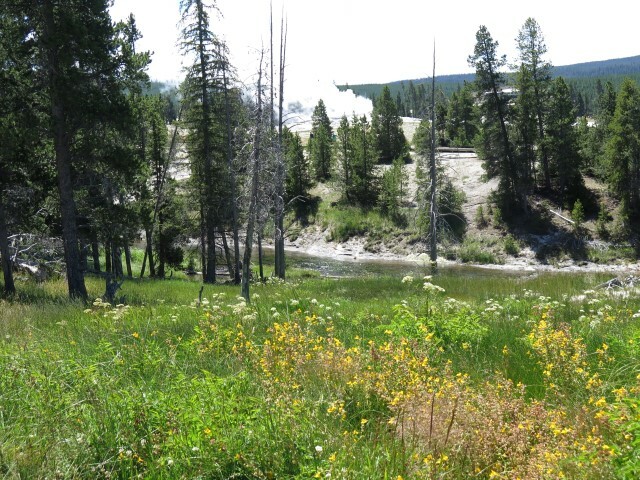 Only about 5% of the park is visible from a road. 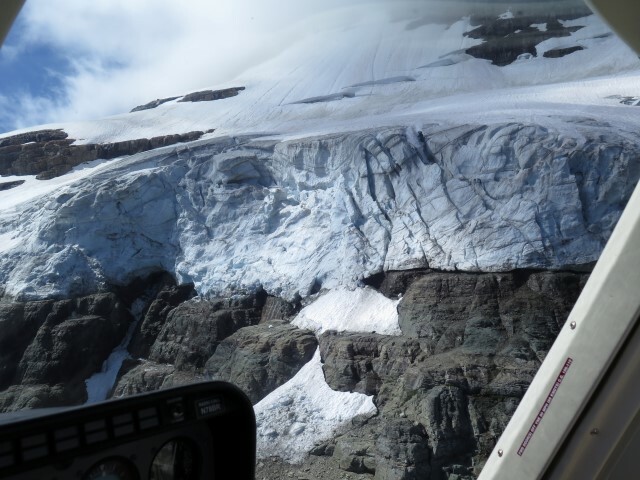 Of the 25 glaciers, only one is visible. So, here are a few of the pictures from that trip. I know, I know. That’s a lot of scrolling. But trust me; there are lots more pictures where those came from. And if it looks like the pictures were taken from someone flying left seat, that’s right. I was. What a treat. 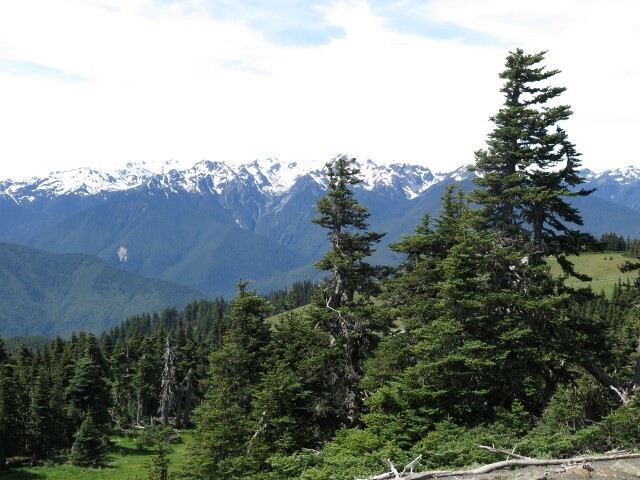 As an aside, we’ve previously noted the virtue of hiking and camping as a family activity. We usually think of that when we see young couples with gaggles with little rug-rats in tow. But this trip presented a particularly heart-warming variation on that theme. 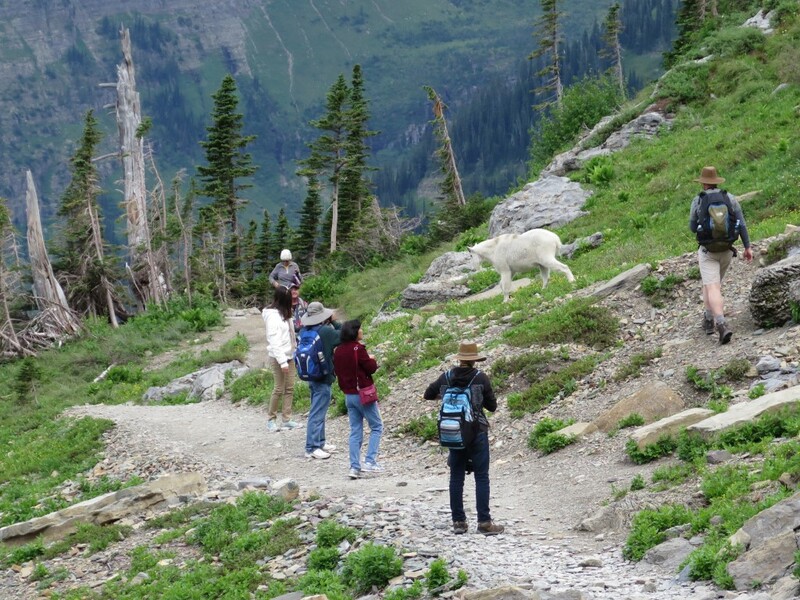 As we hiked up to the Hidden Lake overlook, we came across a family group from Puerto Rico. 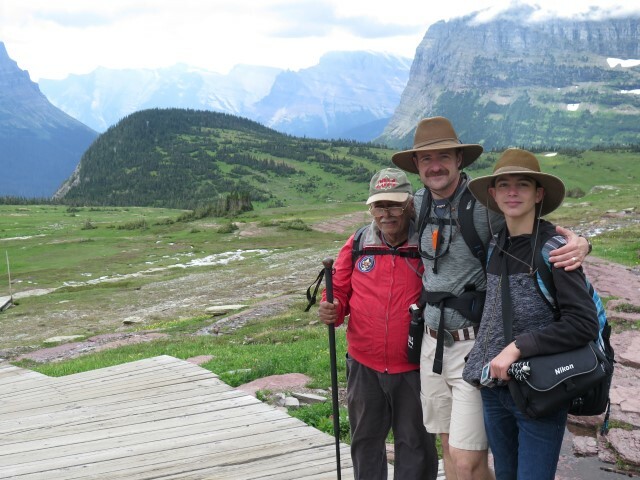 A father, who had been here years ago, not only brought his son here to experience the splendor of this place, but he brought his 77-year-old father along as well. Note to the kids: Pay attention to this photograph. 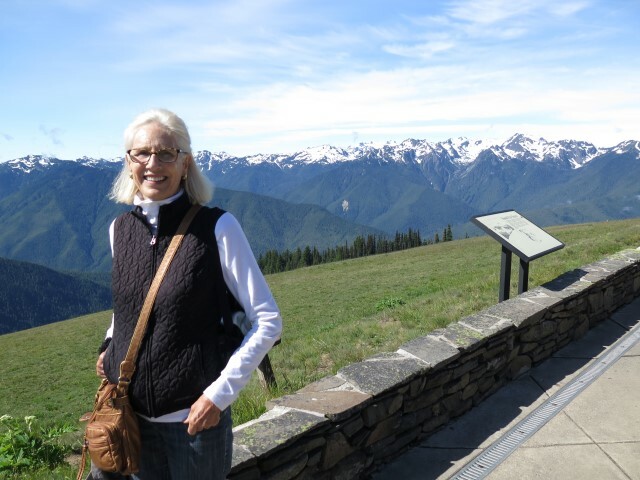 When the day comes that Mom and I are no longer able to make it to such places on our own, you will be expected to lug us along on your trips. Your inheritance (assuming we don’t spend it first) (which we probably will) is at stake. Finally, there are about 30 subscribers to this blog. As near as I can tell from reviewing the analytics, about ten people are following our travels, two readers can’t figure out how to work the unsubscribe function, and the rest are reading only the updates on the dogs. For the benefit of that last group, the dogs are fine. We’ll be heading home in a few days and there’s really no point now in having them put to sleep. We’ll reevaluate their status before we leave on the next trip. 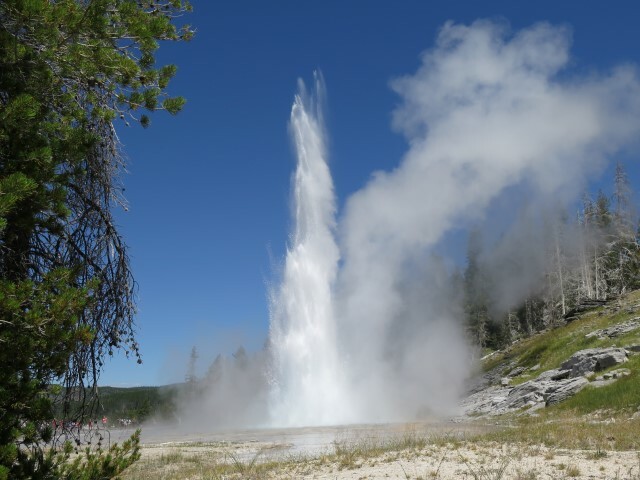 We’re off to Cody, Wyoming, for a few days, then we’ll start the pedal-to-the-metal return trip. This entry was posted in Travels on July 25, 2016 by skiprd. What can one say about this place that hasn’t been said better a thousand times before? Even pictures are bound to be boring and dull because Ansel Adams already outdid anything anyone else could ever do. So that’s the end of this post. Goodbye. Never mind. I can’t stop myself. In fact, with six days in the park, this post is going to be a longie. One of the many pullouts for slow traffic (that would be me) along the Snake River as we head north. This is nothing, just the drive to the place where things start getting scenic. We checked in, got the relevant information, and mapped out what to do over the next few days, only to confirm that, once again, we had too much to do and not enough time to do it. Then, as luck would have it, our insufficient stay was made worse by the fact that the weather on Monday, instead of clearing up as forecast, stayed wet and windy. 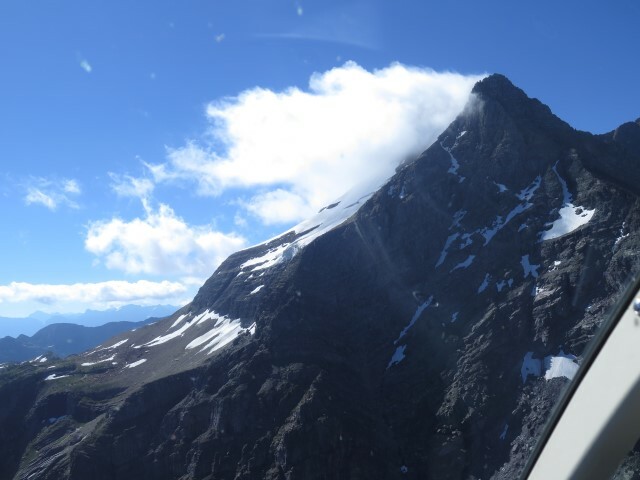 So we were forced to spend that day mostly touring around in the car. Still, though, perhaps as more of nature’s gradual immersion process, even on a dismal day the drama of the Grand Tetons is apparent. This “Cathedral Group” of the Grand Tetons from across Jenny Lake. And then, nature, apparently believing that we were sufficiently accommodated to bear the sight of the mountains, cleared out the weather and gave us the full monty view of the Grand Tetons. Mt. Moran and Grand Teton Mountain, from the Jackson Lake Lodge deck. 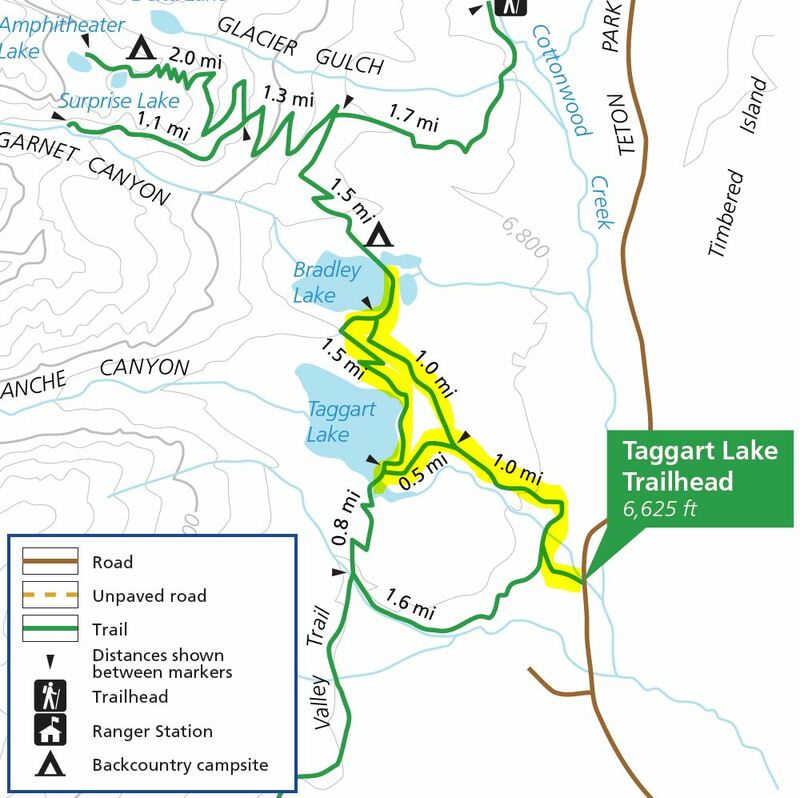 Tuesday, we finally got to get out and do some hiking, doing a five-mile hike up and around Taggart and Bradley Lakes. 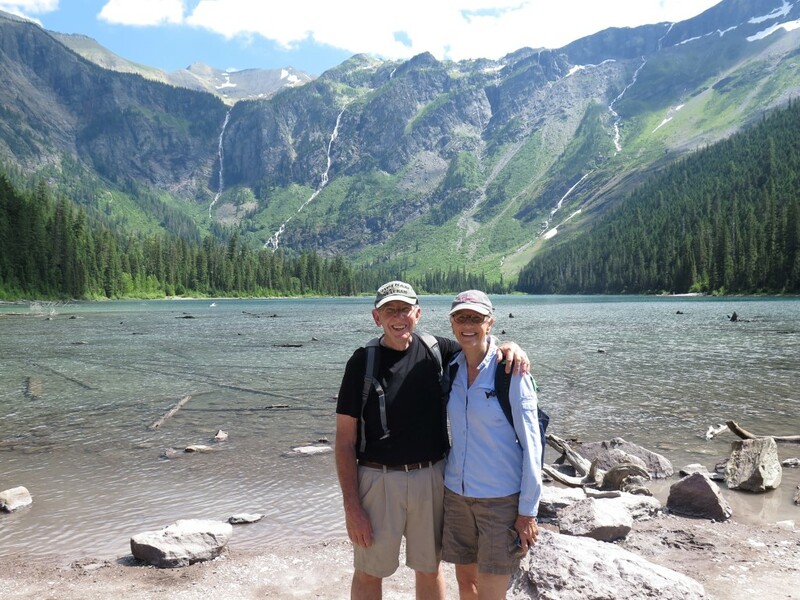 Taggart Lake, one of about a gazillion glacial lakes in the Tetons, all of which are this scenic or better. Yet the effect never diminishes. Wednesday was a fishing day, although it turned out to be more of a scramble-around-and-be-stupid day, an activity for which we appear to be eminently suited. 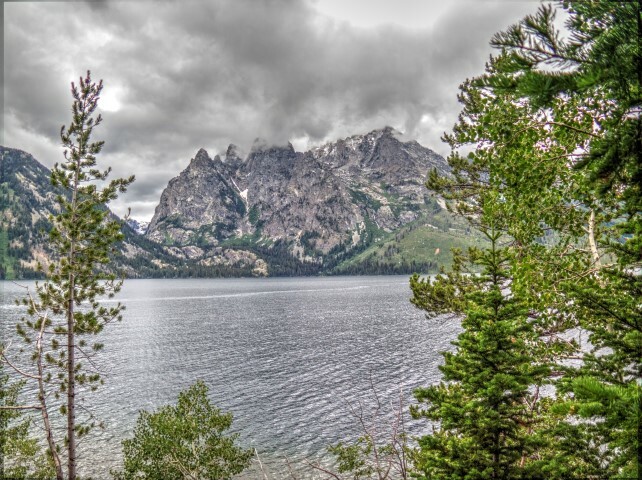 The story is too long and too convoluted to recount, but it began with a 6000-calorie breakfast buffet at the Jackson Lake Lodge and ends with a perfect fishing spot on Jenny Lake recommended by Cliff and, brace yourself, yet another stunning view. 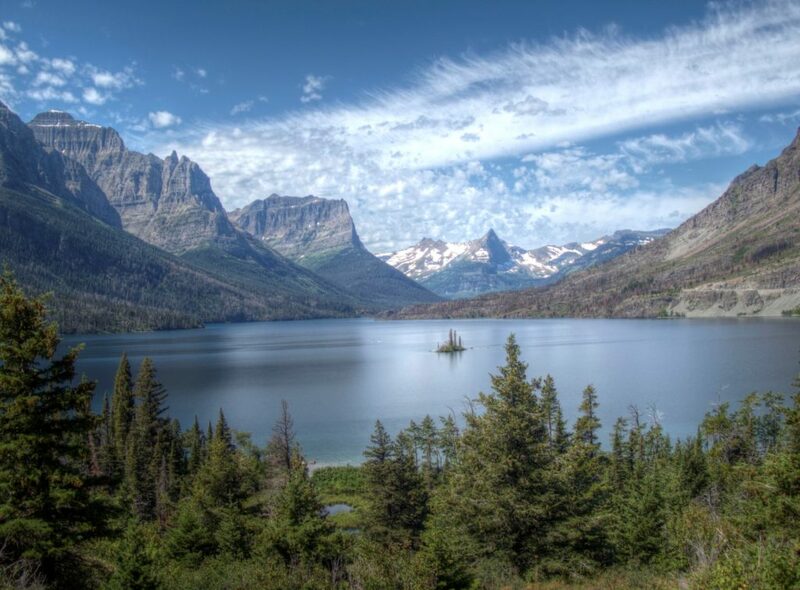 A secret fishing spot at Jenny Lake. Seriously? This is”fishing”? Fishing doesn’t get any better than this, even though I only caught one little trout. Actually, life doesn’t get any better than this. 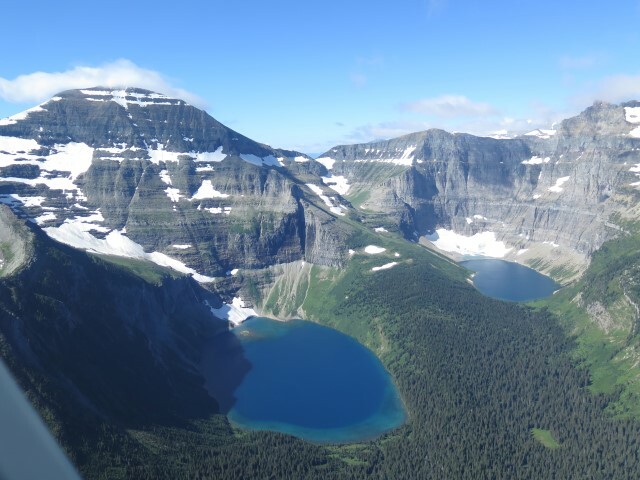 Thursday and Friday were more taken up with more hikes through more stunning views. 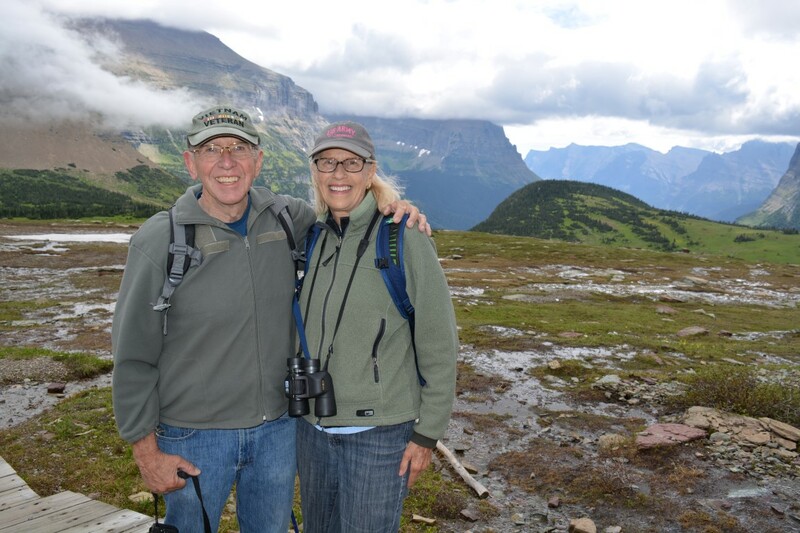 I know that sounds like a lot of hiking for two old wussie geezers (i.e., “wheezers”), but we seem to be doing surprisingly well. 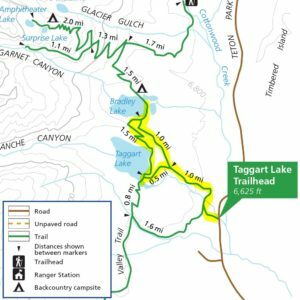 Grand Tetons has over 200 miles of trails, and those that are less than 8 to 10 miles long or so, rated as “moderate” or less with only limited sections of “strenuous,” are all just fine for us (and there are dozens of such trails) . It would take us weeks to exhaust the possibilities. 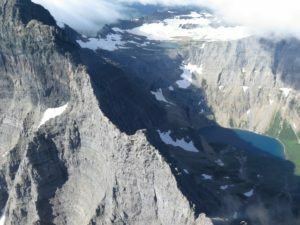 So Thursday we did the other end of Jenny Lake and up (and up and up and up) to Inspiration Point. That hike, as it turned out, was one of more crowded we’ve experienced so far, which is not to be wondered at: every fifteen minutes the ferry boat unloads another group of 35 tourists who make the trek (or at least try to make the trek) 400 feet up to the prominence (which is roughly equivalent of taking the stairs to the top of a 38-story office building). On the way up to Inspiration Point, overlooking Jenny Lake. 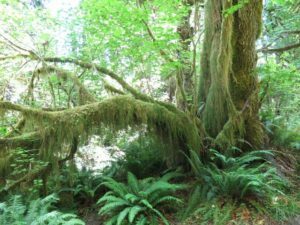 On Friday, it was a ranger-guided hike at the Laurance S. Rockefeller Nature Preserve. There’s too much to say about the experience, especially since we had never visited this end of the park before, but two points are significant. 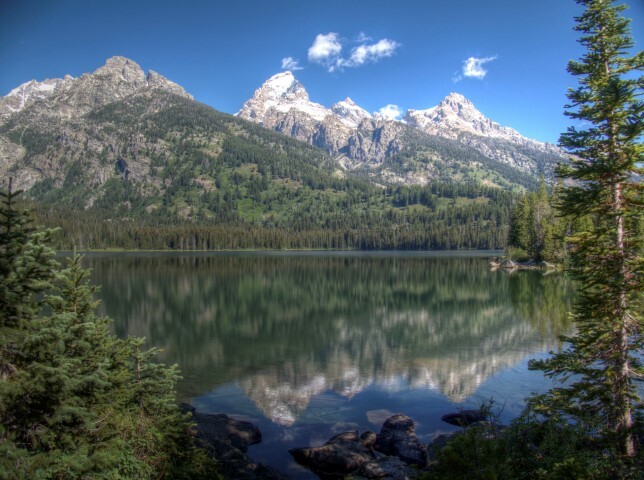 First, Grand Tetons National Park would be something altogether different were it not for the Rockefellers. 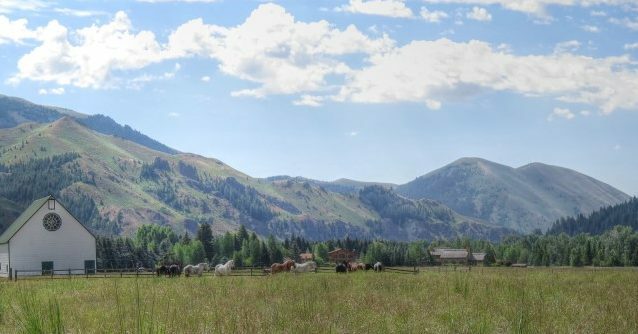 Just one example: When John D. Rockfeller had agreed that the Grand Tetons area was a risk of intrusion from commercial interests in the Jackson Hole valley, he asked what he could do to help. Horace Albright put together what he viewed as the most aggressive request he could imagine, which would have involved Rockefeller buying up land worth a few million dollars. Although he was embarrassed to be asking for so much from a man who had already done so much, he presented the plan to Rockefeller anyway. Rockefeller responded, “Mr. Albright, you misunderstood what I was asking you for. 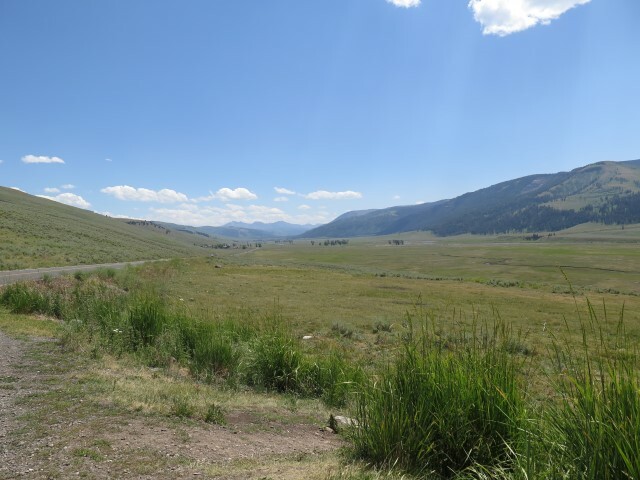 I want to know how much it would cost to buy the entire valley.” That family legacy continued, with Laurance donating the family property, several thousand acres, which is now the nature preserve section of the park. The second point is this. Among the resources possessed by the National Park Service, we have come to conclude that the most valuable is the ranger cadre itself. Every ranger we met was knowledgeable, friendly, accessible, and dedicated (and probably underpaid). 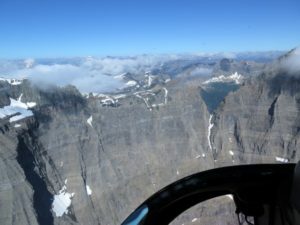 We attended four separate ranger programs at Grand Tetons, and all of them, every single one, was outstanding. And none was better than the ranger-guided hike at the Rockefeller Nature Preserve. Our ranger, Lisa Simmons, was not only unbelievably knowledgeable about the flora and fauna of the area, she had a style of engagement that made the experience doubly memorable. 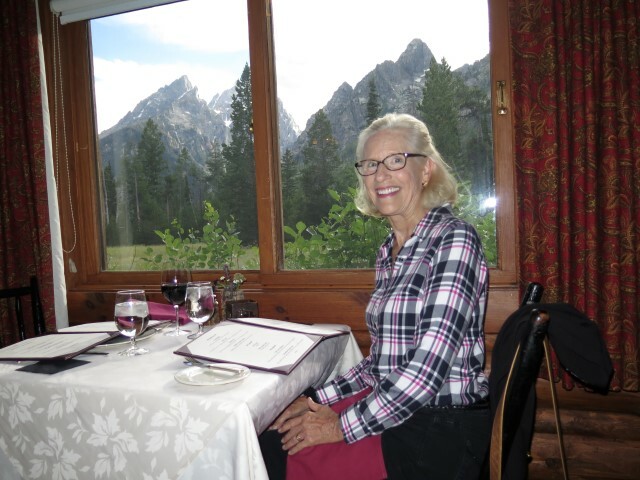 One example: she would from time to time stop and pose questions as a way of engaging us in a discussion, including ones that were often pleasantly philosophical, such as, “Tell me what the experience of the Grand Tetons does for you? What does it mean?” Everyone responded with statements about the beauty of creation, the sense of man’s place in nature, the importance of preserving such areas, and so on, until the discussion got to a couple visiting from Germany, who said, “This place helps me to understand a lot about America. In Germany, we have parks, but they are small. 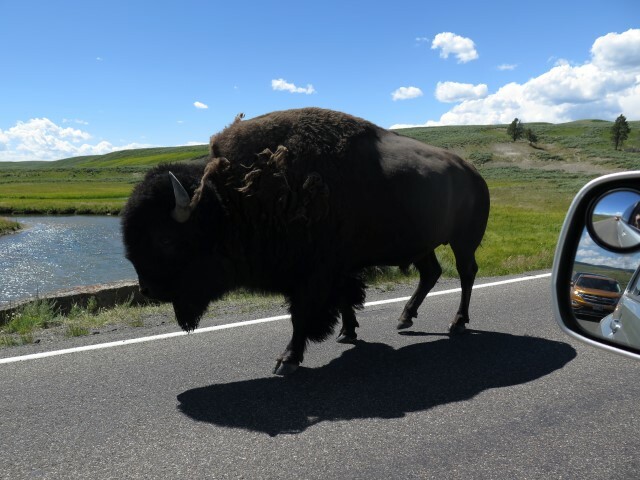 Here, everything is so big, and besides that such big places help us to understand the size and power of nature itself, seeing places like this helps us understand why you Americans have always been so good at thinking big ideas, why you always see limitless possibilities…” Excuse me? This is a chit-chat on a nature hike? And it happened several times as we ambled along, all facilitated and encouraged by a ranger who knew her stuff at many different levels. 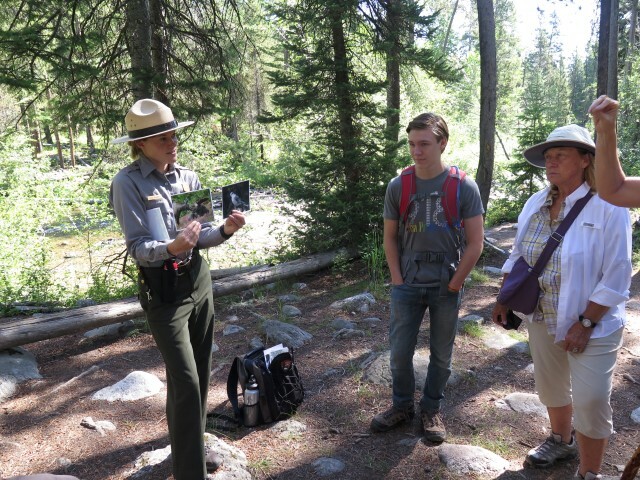 Our ranger, Lisa Simmons, leading a discussion on symbiosis in nature. Here, she asked us to guess how the moose and grey jay exist in a symbiotic relationship. This was just one of about a dozen stops where she used a discussion method instead of the conventional “sage on a stage” manner of conveying her incredible knowledge. 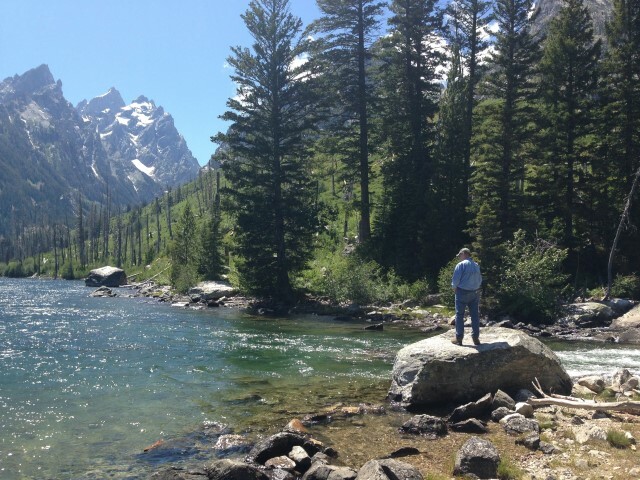 Once I get back to Atlanta and can organize the photographs, the Grand Tetons photo album will be located here. 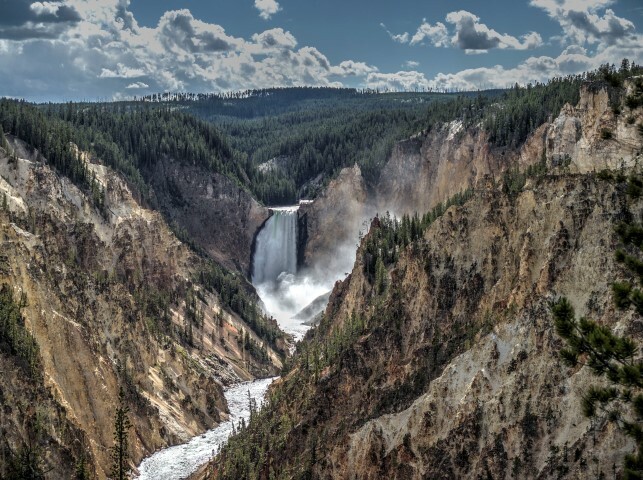 Today we’re off the Yellowstone. P.S. For those nervously awaiting an update on the fate of our little wiener dogs, they’re still alive. This entry was posted in Travels on July 16, 2016 by skiprd. 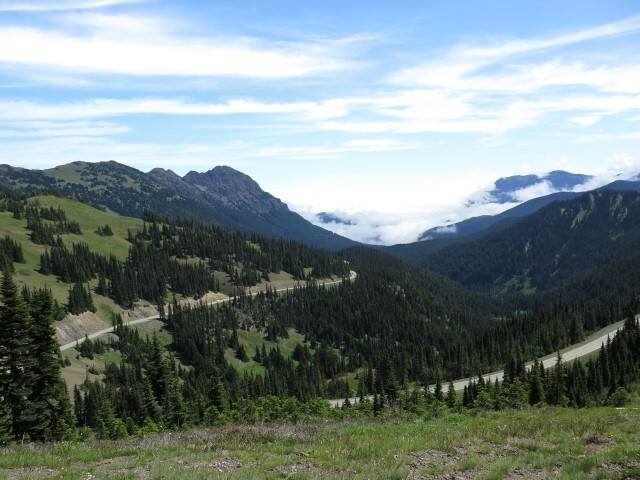 We’ve found ourselves in a somewhat different circumstance: we left Port Angeles a day early, and then decided to shave a day off the Ketchum stop, so we had an unexpected opportunity to move west at a very leisurely pace, like only 150 to 200 miles per day. So, we ambled along (even more amblish than our usual snail’s pace) from Port Angeles, to Cascade Locks OR, Pendleton OR, Caldwell ID, Ketchum ID, and Idaho Falls ID, creeping along towards the real destination at this point, Grand Tetons National Park. Coincidentally, we sort-of traced the Oregon Trail, except in reverse, like if maybe the early settlers decided Oregon was destined to be too weird, gave the whole territory back to the Indians, and returned home for the good of future generations. And what we decided is that this pace is too slow. There’s really no reason to get off the road at lunchtime just to go to a campground so we can, well, go to the campground. If we had it to do over, although leaving Port Angeles and getting out of the infernal rain was a good idea, we’d do a different moseying-along route that would give us more to do at each stop. With two exceptions. 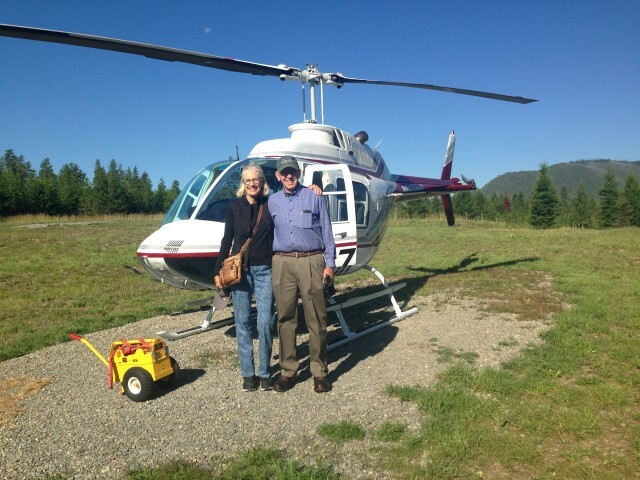 Our stop in Ketchum did allow us not only to see the beautiful Sawtooth Mountains area of Idaho, but also to see a long-lost friend whom he hadn’t seen in, eee-gads, probably 30 years! 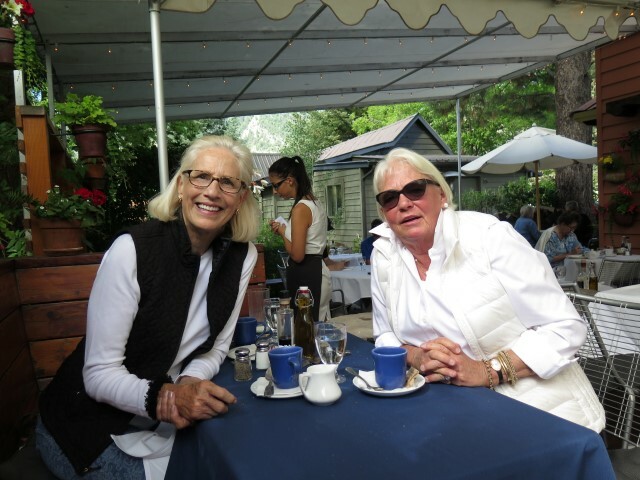 Breakfast at Cristina’s Restaurant with our friend, Carol Thielen, who lives full-time in Ketchum. 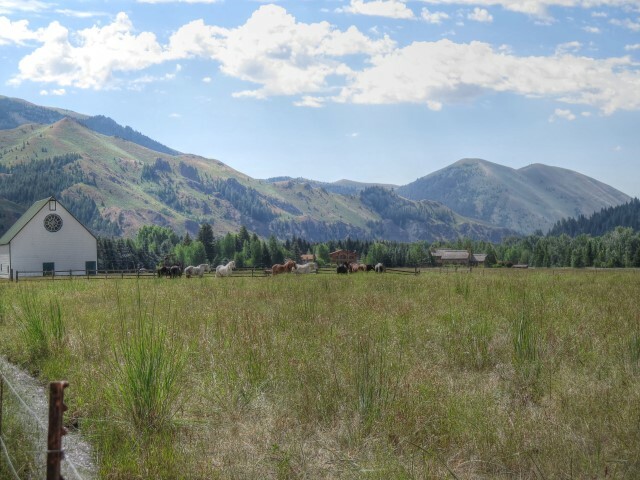 And Ketchum is, of course, story-book beautiful. No, those aren’t stuffed horses in front of a fake barn, propped up in front of a painted background. It just looks that way. 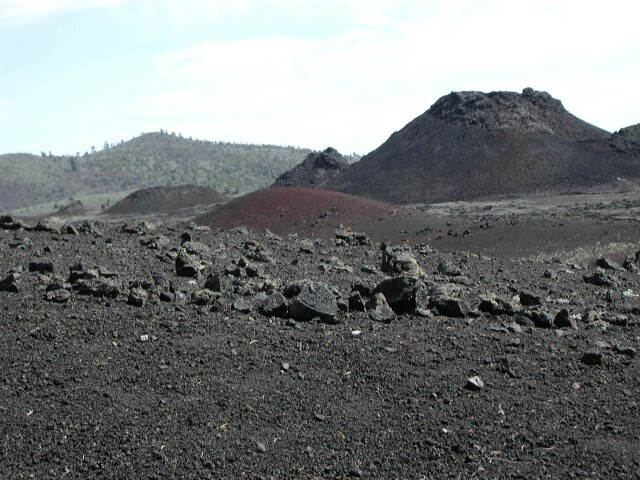 Second, our route took us through Craters of the Moon National Monument. 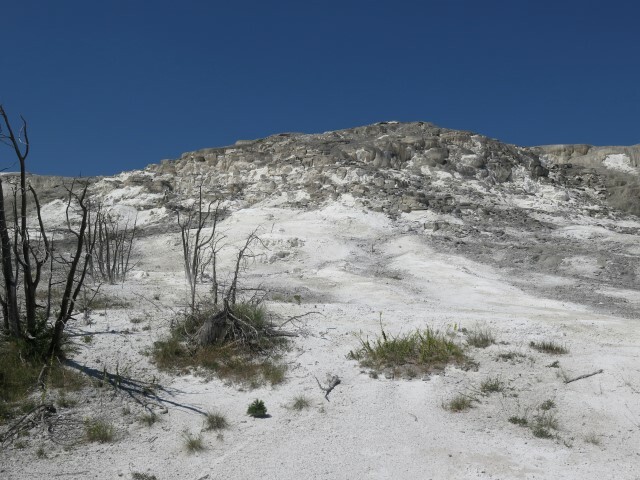 Miles and miles of lava flows, cinder cones, lava blog-thingies, and just weird stuff, all the weirder because it’s plopped down in the middle of the Idaho high desert at odds with everything that surrounds it for miles in every direction. 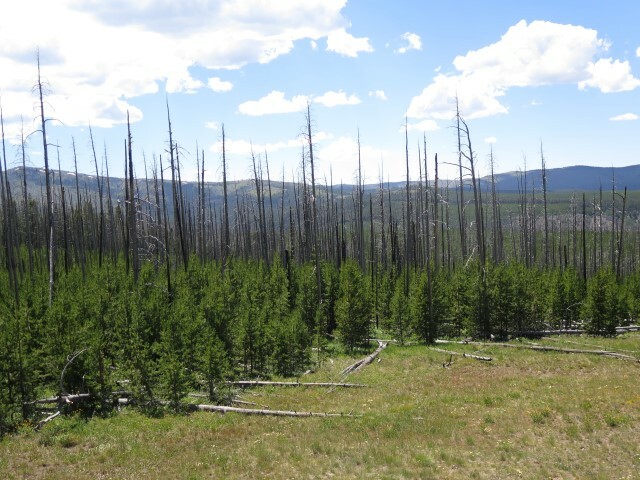 Why put all this in the middle of Idaho? Seems like it would be more appropriate in Hawaii. Or Mars. Still, very, very interesting. And speaking of weird stuff, the route also took us past miles and miles of the Idaho National Laboratories, also plopped down in the middle of the Idaho high desert, but this time it’s perfectly apparent why it’s there. The signs along the barbed wire fence line only say “RESTRICTED AREA,” but I’m pretty sure this is where the government conducts it’s top-secret operations, such as those that resulted in the fake moon landing, training for the CIA operatives who assassinated JFK, and planning for the eventually military takeover of the United States. Really. Look it up. One more thing about striking vistas. One of the most dramatic landscapes in this country has got to be the Columbia River gorge. Sheer rock faces, with flat buttes above, framing a mighty river–the sight is truly unforgettable. Or maybe I should say, one of the formerly most dramatic landscapes. The buttes and canyons that border the river are now largely populated with wind turbines. Hundreds of huge, 2- to 3-megawatt turbines, one after another, for large portions of the gorge. 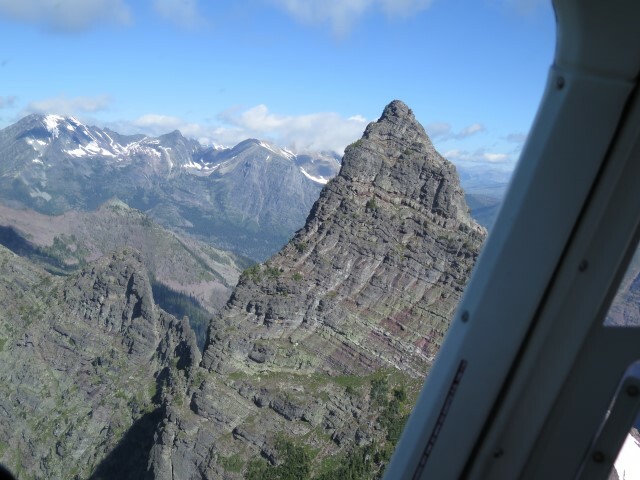 We’ve seen the same thing over and over wherever there are dramatic buttes and ridges. Which got me thinking. In the earliest days of the industrial revolution, there were whole cities covered in steel mills, textile mills, power plants, and such things, all with huge smokestacks covering the area with black smoke and casting a gray pall over everything. By today’s standards, it looks hideous. But I’m sure back then those who saw it didn’t consider it ugly; it was a sign of progress, affluence, and development. It was, in its own way, beautiful. So, is the same true now for wind turbines? By modern standards, those white towers with slowly rotating blades look like progress and responsible social development, beautiful in their own way, even though by some objective, more aesthetic, standard, one might view it all as despoiling the landscape. 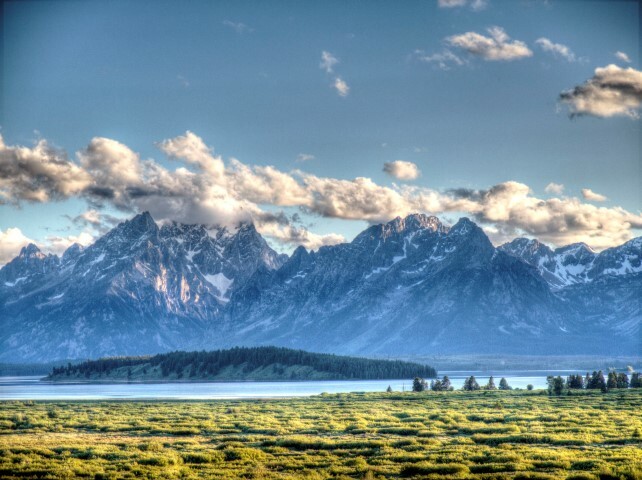 (Imagine the horror, for example, if someone proposed to install wind turbines along the ridges of the Grand Tetons.) Maybe someday, someone will start tearing down wind turbines in order to “restore” the natural beauty of the Columbia Gorge? Oh well … this is the kind of post that just pops out when our travels don’t otherwise provide much material. 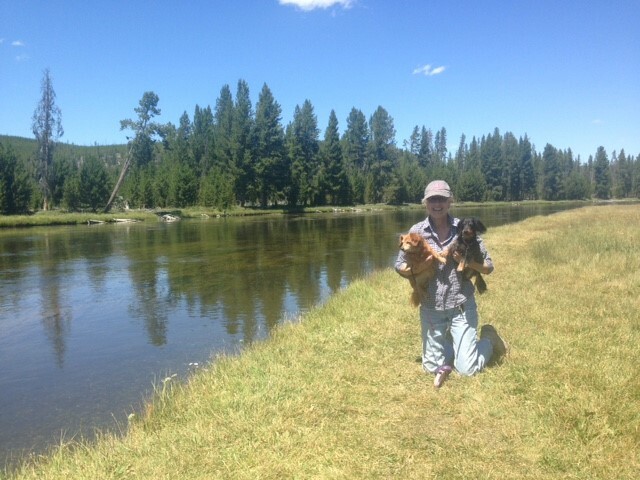 Future posts will be back to reality (mostly): next stop is the Grand Tetons! This entry was posted in Travels on July 10, 2016 by skiprd. 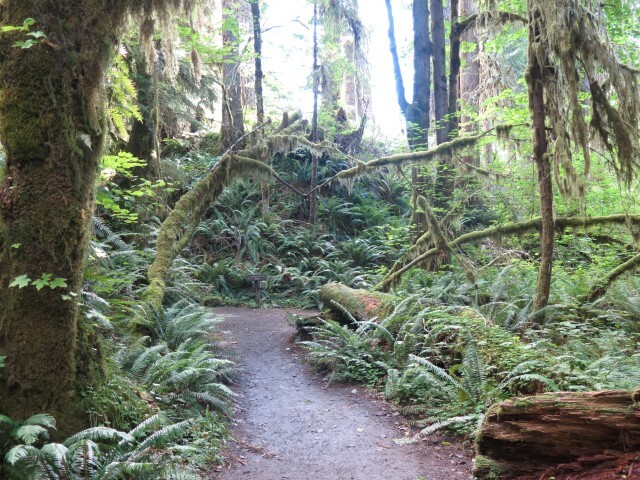 We weren’t sure what to expect from Olympic National Park. 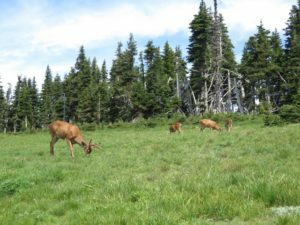 Neither one of us had ever been here before, and the place is not only huge (over a million acres), it has three separate and largely disconnected areas: the Olympic mountain range accessible only from the eastern side, a temperate rain forest on the western side of the mountains, and a shoreline area running for nearly 60 miles on the Pacific coast. We had booked four full days for our stay in Port Angeles, but at least one of those was reserved for a trip to Victoria, British Columbia. Once we started to map out that option, though, it was clear it wouldn’t work. It’s 3 hours on a ferry to-and-fro, with a limited ferry schedule, and with the necessity of clearing immigration on both sides. And we’d need a car and/or a tour bus. And, contrary to my expectations, the dogs are still alive, meaning we’d either need to find care for them in Port Angeles or take them with us. Plus, the weather remained oppressive. Good grief. Where’s global warming when you need it? So, bag Victoria. The good news about taking Victoria off the list, though, is that it gave us an extra day for the Olympic peninsula. Mile after mile of clinging to a desperate hope that there must be something scenic out there somewhere and somehow maybe we’d get to see it. And then, patches of blue sky began to appear above us, revealing that the damnable cloud layer was confined to lower elevations, leaving us with an entirely different view. What a strange and wonderful physical presence. 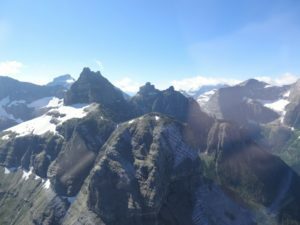 A range of glacier-covered mountains, rising to 8000 feet, but right on the other side of those dramatic peaks, not more than a few miles west, is the Pacific Ocean, which, unless something is seriously wrong, must be at sea level. 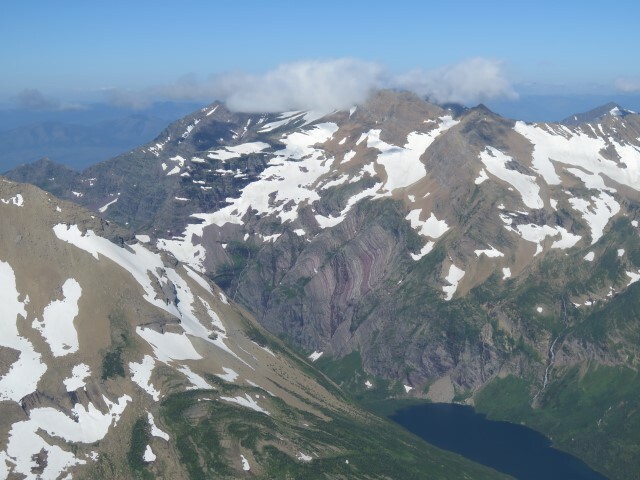 It is that formidable barrier created by the Olympic mountains abutting the Pacific Ocean that creates both the alpine environment here on the eastern side, and the drenching rain forest (over 140 inches per year) over yonder on the west. 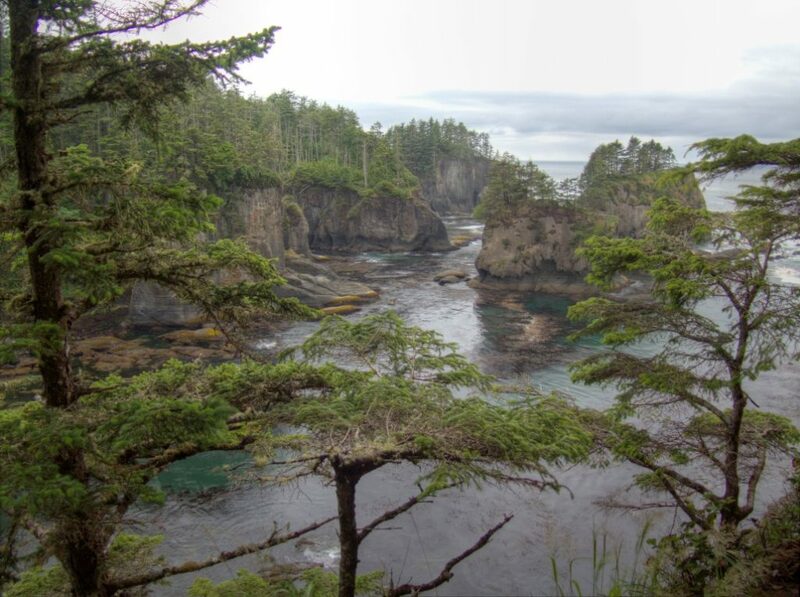 These little web-postable photographs can only vaguely suggest the dramatic beauty of the coastline that appeared before us (someday I’ll post links to high resolution versions of the same pictures), but even in low-res format, perhaps the effect is apparent. Of all the coastlines we have ever seen, ranging from Big Sur to Maine, this was by far the most stunning. The vista was literally breathtaking in the sense that it was so unspeakably beautiful it was actually hard to breathe. The whole excursion to the Olympic peninsula was now worth it. 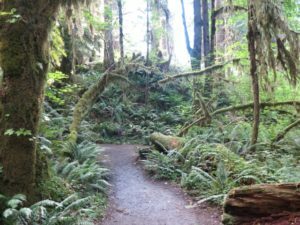 After that experience, the rest of our touring the Olympic peninsula was bound to be something of a letdown. Second day: off to the western side. The Hoh rain forest was interesting in the sense that every square inch of space, horizontally and vertically (which can be 200 to 300 feet straight up for Douglas firs) is covered with a mat of moss, lichen, ferns, and epiphytes, leading to a beautiful, although somewhat creepy, environment. 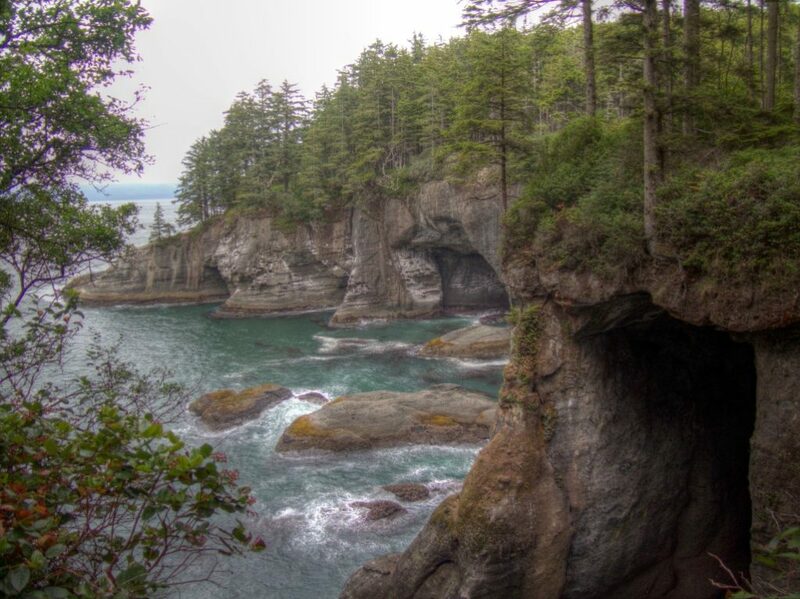 And then we went off to Rialto beach, part of the third unit of the park, which was to my way of thinking (especially in comparison to Cape Flattery) completely forgettable. 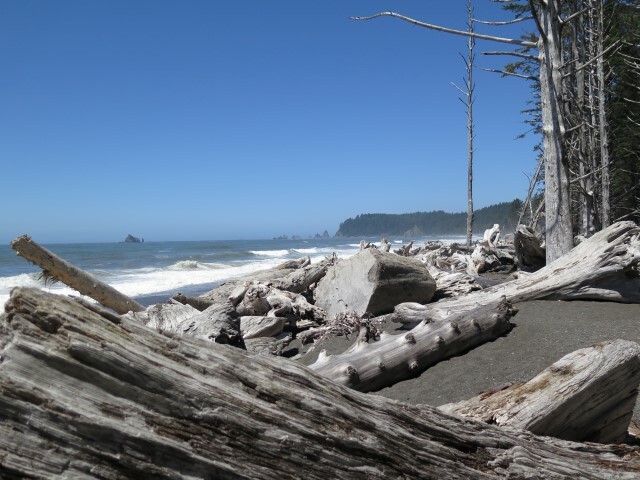 Mile after mile of driftwood, thousand-pound logs that used to be in the river but were tossed up on the beach like so many matchsticks by the winter storms that pummel the area. This is at high tide and the logs are WAY uphill. As the warning signs point out, this is NOT a place for a stroll during a storm. And then, after returning to camp and spending the afternoon tending to a few chores, we decided to start the westward trip a day early. 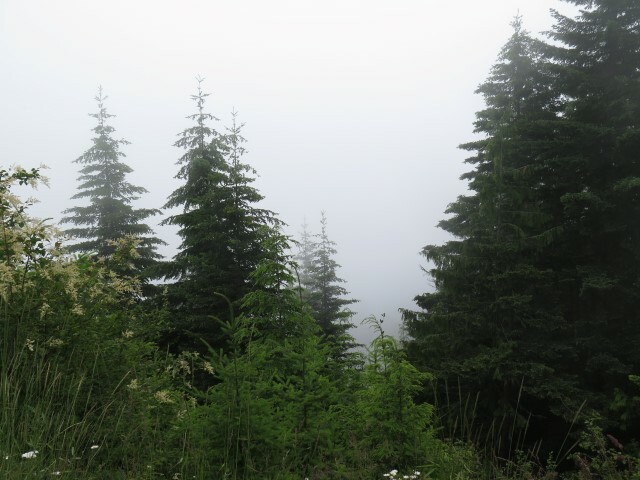 The weather here is expected to be typical for the next four days, which is to say miserable, and we thought it would be fun to add a side trip up the Columbia River gorge. So, we’ve redone the route a bit, heading south before heading west. I’m not sure we’ll make it. 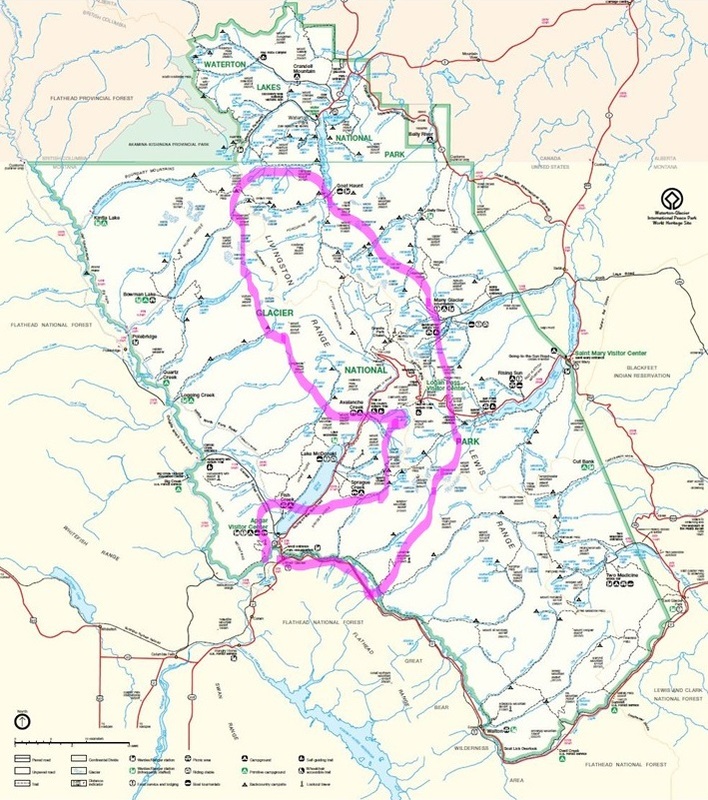 Our revised route takes us over the Hood Canal floating bridge, which sank in a wind storm in 1979, and the Tacoma Narrows Bridge, which disintegrated in a wind storm in the 1940s. There’s actually a Youtube channel dedicated to “Washington Bridge Disasters.” So, add to our memoir this thought that we may never get out of here alive. Assuming we survive the planned route to I-5, though, further posts will follow. This entry was posted in Travels on July 5, 2016 by skiprd.